JMIR Perioperative Medicine (JPOP, Editor-in-chief: John F. Pearson MD, Harvard Medical School) is a new sister journal of JMIR (the leading open-access journal in health informatics (Impact Factor 2017: 4.671), focusing on technologies, medical devices, apps, engineering, informatics and patient education for perioperative medicine and nursing, including pre- and post-operative education, preventative interventions and clinical care for surgery and anaesthesiology patients, as well as informatics applications in anesthesia, surgery, critical care and pain medicine. As open access journal we are read by clinicians and patients alike and have (as all JMIR journals) a focus on readable and applied science reporting the design and evaluation of health innovations and emerging technologies. We publish original research, viewpoints, and reviews (both literature reviews and medical device/technology/app reviews). During a limited period of time, there are no fees to publish in this journal. Articles are carfully copyedited and XML-tagged, ready for submission in PubMed Central. Background: Web-based technology is useful as an alternative means of providing preparation programs to children in pediatric care. To take full advantage of Web-based technology, there is a need to understand how children use and learn from such programs. Objective: The objective of this study was to analyze children’s use of and experiences with a Web-based perioperative preparation program in relation to an educational framework of children’s learning. Methods: This study is the final part of a three-phase study in which all families with children aged 3 to 16 years (N=32) admitted for outpatient surgery over 1 week were asked to participate. Children were interviewed before (phase 1) and after (phase 2) anesthesia and surgery and 1 month after hospitalization (phase 3). The data in this study (phase 3) relate to six children (5 to 13 years) who participated in the follow-up interviews in their homes a month after hospitalization. The study used a directed qualitative interpretative approach. The interviews were conducted in a semistructured manner as the children—without guidance or influence from the interviewer—visited and navigated the actual website. The data were analyzed based on a combination of the transcribed interviews and field notes, and were subjected to a previous theoretical investigation based on children’s learning on a website in pediatric care. Results: Six children, five boys (5-12 years) and one girl (13 years), participated in the follow-up study in their homes a month after hospitalization. The children were selected from the 22 initially interviewed (in phases 1 and 2) to represent a variation of ages and perioperative experiences. The children’s use of and experiences with the website could be explained by the predetermined educational themes (in charge of my learning, discover and play, recognize and identify, and getting feedback), but additional aspects associated with children’s need for identification, recognition, and feedback were also revealed. The children used the website to get feedback on their own experiences and to interact with and learn from other children. Conclusions: This analysis of children’s use of and experiences with a Web-based preparation program emphasizes the importance of including a theoretical educational framework of children’s learning in the development and design of websites in pediatric care. Creating opportunities for Web-based communication with others facing similar experiences and possibilities for receiving feedback from adults are important factors for future consideration. Background: Child life therapists provide patient education for children undergoing radiation therapy to assist in coping with and understanding their treatment. Objective: This proof-of-concept study aimed to determine the feasibility of incorporating a 360-degree video tour via a virtual reality system for children scheduled to receive radiation therapy. The secondary objective was to qualitatively describe each subject’s virtual reality experience. Methods: Children aged ≥13 years scheduled to receive proton radiation therapy were included in the study. 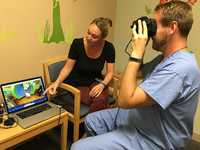 Subjects watched the 360-degree video of the radiation therapy facility in an immersive virtual reality environment with a child life therapist experienced in coaching children receiving radiation therapy and completed a survey after the tour. Results: Eight subjects consented to participate in the study, and six subjects completed the 360-degree video tour and survey. All the enrolled patients completed the tour successfully. Two subjects did not complete the survey. Two subjects requested to pause the tour to ask questions about the facility. Five subjects said the tour was helpful preparation before undergoing proton radiation therapy. Subjects stated that the tour was helpful because “it showed [them] what’s to come” and was helpful to see “what it’s like to lay in the machine.” One subject said, “it made me feel less nervous.” Six subjects stated that they would like to see this type of tour available for other areas of the hospital, such as diagnostic imaging rooms. None of the subjects experienced nausea or vomiting. Conclusions: The 360-degree video tour allowed patients to explore the treatment facility in a comfortable environment. Participants felt that the tour was beneficial and would appreciate seeing other parts of the hospital in this manner. Background: Postoperative cognitive decline (POCD) is defined as a new cognitive impairment arising after a surgical intervention. Aspects of cognitive function can be assessed using various validated cognitive function tests including the N-back task, the Stroop task, and the lexical decision-making task (LDT). There is some concern that prolonged Trendelenburg positioning during laparoscopic colorectal surgery may cause POCD. Objective: The objective of this study was to assess the effect of time spent in the Trendelenburg position on cognitive function. Methods: Volunteers were placed in the Trendelenburg position for 3 hours and, then, supine for 30 minutes. Validated cognitive function tests including 1-, 2-, and 3-back tasks, Stroop test, and LDT were performed at baseline and every 30 minutes after Trendelenburg positioning. Cognitive decline was defined per the International Study of Postoperative Cognitive Dysfunction trial: a decrease in accuracy from the volunteers’ baseline or an increase in response time from the volunteers’ baseline by >2 control group SDs. Results: We recruited 15 healthy volunteers (8 males, 7 females) with an average age of 69 years (range 57-81) and average body mass index of 27.7 kg/m2 (range 20.9-33). Accuracy remained within 2 SDs at all time points. An increase in response time did occur, and of 15 participants, 3 (20%) showed cognitive decline in the Trendelenburg position after 30 minutes, 4 (27%) after 1 hour, 5 (33%) after 90 minutes, 4 (27%) after 120 and 150 minutes, and 6 (40%) after 180 minutes. On moving to a supine position, 33% (5/15) participants showed cognitive decline. Conclusions: The results of this study indicate that Trendelenburg positioning leads to cognitive decline. This may have implications for patients undergoing prolonged Trendelenburg positioning during laparoscopic colorectal surgery. Background: Hospitalization is a significant and stressful experience for children, which may have both short-term and long-term negative consequences. Anaesthesia-Web is a Web-based preparation program that has been well received and is being used worldwide to reduce stressful experiences, increase understanding, and exchange information in pediatric care. A deeper theoretical and educational understanding encompassing children’s learning processes on Anaesthesia-Web may optimize and support the development and design of similar websites for children in pediatric care. Objective: The objective of this study was to elucidate key educational principles in the development and design of websites for children in pediatric care. Methods: A directed qualitative content analysis was applied to analyze the content and design of Anaesthesia-Web from a theoretical and educational perspective. preunderstanding, motivation, learning processes, and learning outcome were used to analyze the learning possibilities of Anaesthesia-Web for children prior to contact with pediatric care. Results: We found 4 themes characterizing children’s learning opportunities on Anaesthesia-Web in the analysis: “In charge of my learning”; “Discover and play”; “Recognize and identify“; and “Getting feedback”. The analysis showed that Anaesthesia-Web offers children control and enables the use of the website based on interest and ability. This is important in terms of motivation and each child’s individual preunderstanding. Through discovery and play, children can receive, process, and apply the information on Anaesthesia-Web cognitively, emotionally, and by active participation. Play stimulates motivation and is very important in a child’s learning process. When facing pediatric care, children need to develop trust and feel safe so that they can focus on learning. On Anaesthesia-Web, children can recognize situations and feelings and can find someone with whom to identify. Several features on the website promote feedback, which is necessary to judge learning achievements, confirm understanding, and embody the need for repetition. Conclusions: Web-based preparation programs are important learning resources in pediatric care. Content and design needs to change from simply providing information to embracing the importance of a child’s need to process information to learn and fully understand. By developing Web-based preparation programs that include educational principles, Web-based technology can be used to its fullest advantage as a learning resource for children. The 4 educational themes described in this study should help future similar website developments within pediatric care. Background: The incidence of perioperative visual loss following colorectal surgery in the US is quoted as 1.24 per 10,000. Raised intraocular pressure (IOP) during extreme Trendelenburg position leading to reduced optic nerve perfusion is thought to be a cause. Objective: To assess the effect of the degree of Trendelenburg tilt and time spent in Trendelenburg on IOP during laparoscopic colorectal surgery. Methods: Fifty patients undergoing laparoscopic colorectal surgery were recruited. A Tonopen XL applanation tonometer was used to take IOP measurements hourly during surgery, and each time the operating table was tilted. A correlation coefficient for the degree of Trendelenburg tilt and IOP was calculated for each patient. Group 1 included patients undergoing a right-sided colonic procedure, and Group 2 included all left-sided colonic operations. Results: The mean age of Group 1 participants (n=25) was 69 years (SD 14), and Group 2 (n=25) was 63 years (SD 16; P>.05). 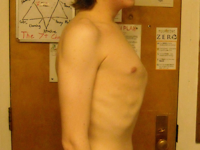 The average length of surgery for Group 1 was 142 minutes (SD 48), and Group 2 was 268 minutes (SD 99; P≤.05). The mean maximum degree of Trendelenburg tilt in Group 1 was 10 (SD 7) and Group 2 was 19 (SD 6; P≤.05). The mean IOP increase was 9 mm Hg (SD 5) for Group 1 and 15 mm Hg (SD 5) in Group 2 (P≤.05). An overall correlation coefficient for the degree of Trendelenburg tilt and IOP change (n=48) was .78. Conclusions: There is a strong correlation between IOP elevation during laparoscopic colorectal surgery and the degree of Trendelenburg tilt. 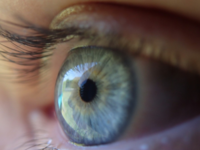 This may be significant for patients undergoing prolonged surgery and especially those with glaucoma. Background: Surgery holds high risk for iatrogenic patient harm. Correct and sufficient communication and information during the surgical process is a root solution for preventing patient harm. Information technology may substantially contribute to engaging patients in this process. 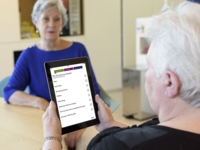 Objective: To explore the feasibility of a digital patient-led checklist for cataract surgery, we evaluated the experiences of patients and nurses who have used this novel tool with a focus on use, appreciation, and impact. Methods: A multidisciplinary team, including cataract surgeons, nurses, pharmacists and administrative representatives developed a 19-item digital patient-led checklist for cataract patients who underwent surgery in an ambulatory setting. This “EYEpad” checklist was distributed to patients and their companions during their hospital visit via an application on a tablet. It contained necessary information the patient should have received before or during the surgical preparation (8 items), before anesthesia (2 items), and before discharge (9 items). 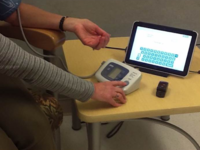 Patients and their companions were invited to actively indicate the information they received, or information discussed with them, by ticking on the EYEpad. Our qualitative research design included semi-structured individual interviews with 17 patients and a focus group involving 6 nurses. The transcripts were analyzed by 2 independent coders using both deductive and inductive coding. Results: All but one of the 17 patients used the EYEpad, occasionally assisted by his or her companion (usually the partner). In several cases, the checklist was completed by the companion. Most patients felt positively about the usability of the EYEpad. Yet, for most of the patients, it was not clear why they received the checklist. 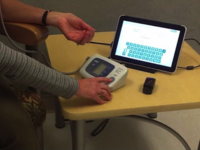 Only 4 of them indicated that they understood that the EYEpad was used to determine if there were sufficient and correct information discussed or checked by the nurses. Although most nurses agreed the EYEpad was easy to use and could be a useful tool for improving patient engagement for improving safety, they felt that not all elderly patients were willing or capable of using it and it interfered with the existing surgical process. They also anticipated the need to spend more time explaining the purpose and use of the EYEpad. Conclusions: Our results showed that a digital patient-led checklist is a potentially valid way to increase patient participation in safety improvement efforts, even among elderly patients. It also illustrates the crucial role nurses play in the implementation and diffusion of technological innovations. Increased patient participation will only improve safety when both healthcare workers and patients feel empowered to share responsibility and balance their power. Background: The National Surgical Quality Improvement Program logs surgical site infections (SSIs) as the most common cause of unplanned postoperative readmission for a variety of surgical interventions. Hospitals are making significant efforts preoperatively and postoperatively to reduce SSIs and improve care. Telemedicine, defined as using remote technology to implement health care, has the potential to improve outcomes across a wide range of parameters, including reducing SSIs. Objective: The purpose of this study was to assess the feasibility and user satisfaction of two automated messaging systems, EpxDecolonization and EpxWound, to improve perioperative care in a quality improvement project for patients undergoing total joint replacement. 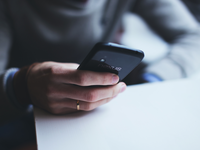 Methods: We designed two automated text messaging and calling systems named EpxDecolonization, which reminded patients of their preoperative decolonization protocol, and EpxWound, which monitored pain, wound, and fever status postoperatively. Daily patient responses were recorded and a post-usage survey was sent out to participants to assess satisfaction with the systems. Results: Over the 40-week study period, 638 and 642 patients were enrolled in EpxDecolonization (a preoperative decolonization reminder) and EpxWound (a postoperative surgical site infection telemonitoring system), respectively. Patients could be enrolled in either or both EpxDecolonization and EpxWound, with the default option being dual enrollment. The proportion of sessions responded to was 85.2% for EpxDecolonization and 78.4% for EpxWound. Of the 1280 patients prescribed EpxWound and EpxDecolonization, 821 (64.14%) fully completed the postoperative system satisfaction survey. The median survey score (scale 1-9) was 9 for patient-rated overall care and 8 for whether the telemonitoring systems improved patient communication with providers. The majority of patients (69.0%, 566/821) indicated that the systems sent out an ideal number of messages (not too many, not too few). Conclusions: EpxDecolonization and EpxWound demonstrated high response rates and improved patient-rated communication with providers. These preliminary data suggest that these systems are well tolerated and potentially beneficial to both patients and providers. The systems have the potential to improve both patient satisfaction scores and compliance with preoperative protocols and postoperative wound monitoring. Future efforts will focus on testing the sensitivity and specificity of alerts generated by each system and on demonstrating the ability of these systems to improve clinical quality metrics with more authoritative data.